Fort Boyard is located between the Île-d’Aix and the Île d’Oléron in the Pertuis d’Antioche straits, on the western coast of France. It is here that the famous TV gameshow of the same name was filmed. 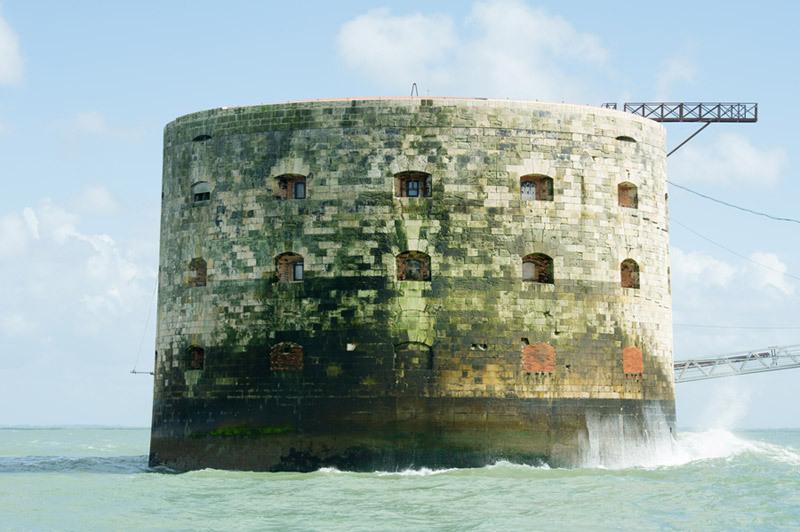 Historically, the idea to build a fort on the Boyard bank was suggested as early as the 17th century but it was not until the 1800s under Napoleon Bonaparte that work actually began. Building operations started in 1801 and the project was completed in 1857. The fort has also been the backdrop for other media endeavors In 1967, the final scene of the French film Les Aventuriers starring Alain Delon and Joanna Shimkus was filmed at the remains of the fort. The original idea for the construction of Fort Boyard was to form a line of fortification with Fort Enet and Fort de la Rade on Île-d’Aix in order to protect the arsenal of Rochefort from British Royal Navy incursions. Because in the 17th century artillery had limited range, the fields of fire between the fortifications on the islands of Aix and Oléron could not overlap. If a fort were built on Boyard bank, roughly mid-way between the two then the gap would be filled. With this in mind, in 1692 the French engineer Descombs began planning the construction of the fort. Unfortunately however it soon became clear that the project would be enormously expensive and so the scheme was abandoned. Louis XIV’s leading military engineer, Vauban, famously advised against it, saying “Your Majesty, it would be easier to seize the moon with your teeth than to attempt such an undertaking in such a place”. Immediately following a British raid on Île-d’Aix in 1757, plans for a fort on Boyard bank were once again considered out of the growing necessity But although plans were drawn up, the logistical problems again meant that it was once again abandoned. In 1800, efforts were renewed under the guidance of Napoleon Bonaparte and a year later, engineers Ferregeau and Armand Samuel de Marescot, and Vice-Admiral François Étienne de Rosily-Mesros came up with a design for a fort to be built on the bank. 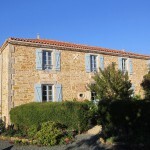 In order to facilitate the work, a port was developed on île d’Oléron and a new village: Boyardville was built to house the workers. Incredibly, the project was suspended yet again in 1809. Construction did once again resume in 1837, under Louis-Philippe, following renewed tensions with the United Kingdom and the fortifications were at last completed in 1857. There was now sufficient room for a garrison of 250 men. In a strange touch of irony, however, by the time the fort was completed, the range of cannons had significantly increased and so Fort Boyard was no longer necessary for national defence. Later in the 19th century, Fort Boyard was briefly used as a military prison, before being abandoned at the beginning of the 20th century. With the passage of time, the fort began to crumble and fall into the sea as it was no longer maintained. 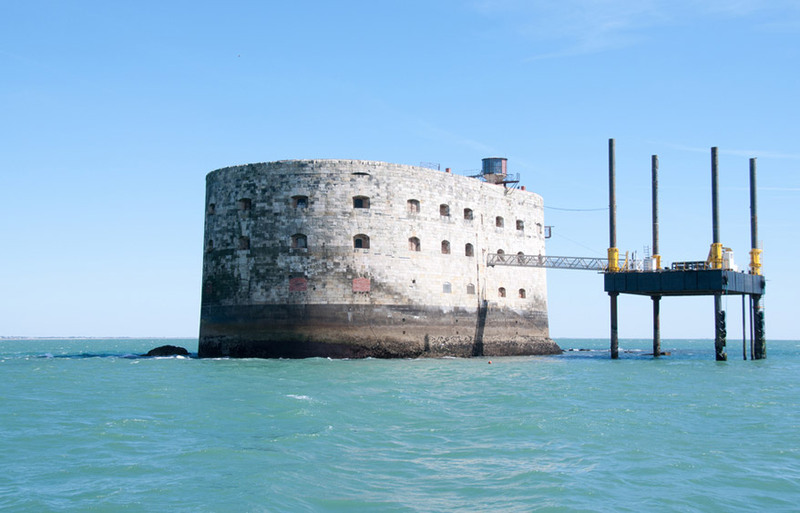 In 1950 Fort Boyard was made a listed building, and in 1961 it was sold to the Regional Council of the Charente Maritime. Boat trips to Fort Boyard start at the beginning of April and finish at the end of September. They continue at weekends in October and start up again during the All Saints November holiday period, as well as during the February school holidays and weekends in March. Prices vary according to the service chosen and the port of departure.